This new knowledge will chasten and surprise many but inspire and enlighten them into a complete adjustment of their understanding. This will give a new value to what they call the meaning and purpose of life. A greater seriousness and a greater joy will permeate their beliefs and actions, and gradually involve them all together in a new dispensation. That time is not far off. The Great Lord is eager to appear and to grace the world by His open, recognized presence. Have no fear. A new world is in the making, which will restore men’s faith and courage in equal order. Q. Is Maitreya still being interviewed on Chinese television? Q. How many interviews have there been since you published information about them in the May 2015 issue of Share International? Q. 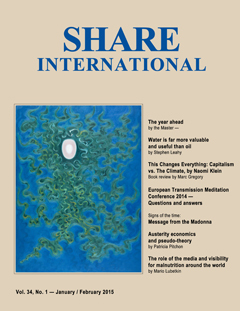 We have read in recent issues of Share International that Maitreya has been working in some Middle Eastern countries. A. He is still working there. So far He has not given any interviews there. Q. Does Maitreya work directly or indirectly talking to environmental groups, or leaders in the ecology field, to advise about how to tackle the urgent climate change problem? Q. How long do you think it will be before viewers in Europe will see Maitreya on television? Q. Is Maitreya’s appearance on Japanese television scheduled to take place within the next 12 months? A. It is possible but is not scheduled. Q. Is it your experience that people generally do not like change? Your Master’s recent three articles refer to the fact that change is coming, that everything is about to change and that while circumstances may become difficult for a time we will come to embrace the changes. A. I agree. People like what they know, to feel safe. Q. What’s the best and quickest way to allow the soul to dominate the personality? Q. Despite the painful effects of austerity measures the UK has voted to keep the Conservative Party in power. What does that tell us about people’s priorities? A. That they are materialistic, that they like the status quo, that they do not like change. It also shows that the British public is very fragmented. Q. Do you think the latest UK election results will gradually sharpen people’s perception and the need to choose for the common good? A. Some are already making this choice. Q. Do you and your Master think that the UK election results will hasten an economic collapse? A. The UK is not so important in this regard. Q. I would like to know, besides the discovery of the etheric planes of matter, what is the next great step that humanity must take in the technological sphere? A. There is only one big step and that is to realize that we are all one, and only that consciousness will bring us to the right relationship to one another. There does not have to be a technological step before this; if you made the world one the rest would follow automatically. On 19 April 2015 at the end of the parade, which is part of the Earth Fair celebration in San Diego’s Balboa Park, there was a man dressed in green with wavy blonde hair. He had a sign that said on one side, “Maitreya is coming” (or to that effect) which caught our attention from our outreach booth. He then turned the sign around and the sign said “in January 2017”. After turning the sign around, he looked toward us and gave a grin which reminded me of the time in Los Angeles when, after receiving a greater than usual energetic stimulus when Benjamin Creme had looked directly at me during the overshadowing, I had seen two faces. Mr Creme’s real face was looking elsewhere and a shadow face had continued to look at me with a very similar grin. Since we never run across anyone in San Diego other than our group providing information about Maitreya and since I do not remember ever seeing someone like this gentleman, was this someone other than a regular Earth Day participant? J. McN., San Diego, CA, USA. At the Paris Conference on 28 March 2015, I was taking care of the sales of SOP Badges and stickers and “Sharing will save the world” stickers booth. There were a lot of people in front of me, picking and buying some materials. I was mostly focused on giving the correct money change. Then, a tall elegant lady was standing in front of me. Her arms were long and thin. All her gestures looked like she was dancing. She was also very quiet and calm. Rather than picking some materials, she began to ask me questions. Looking at the green paper, she asked if this was related to the SOP Badge. I said: “Yes, this is the article of the Master of Benjamin Creme” about SOP! based on SOS. Then, she moved her eyes to the “Share the world” stickers. She said that she was confused about the two things being brought together and asked me very sincerely: “Please, I am lost, explain to me what is the relationship between the two?” I said that the plan for the acceptance of sharing has been so delayed that now we have to come up simultaneously with the need of Sharing to avoid WWIII and the disastrous state of the planet. She looked excited with that and added with a profound voice that she was deeply concerned by this situation and had in view the holding of the Climate conference in Paris at the end of this year. It looked like she was OK with my answer and while she was constantly looking at me straight in the eyes, she turned her head to show her profile and I was quite astonished that her nose had a strong shape of an eagle! Would you please kindly tell me who was this woman? On 27 February 2015 at about 9pm on the way home from work, my friend and I saw an unusually large bright object low in the western sky as we looked towards Auckland. I was surprised that no one else was looking and pointing as I’d never seen anything as large and bright in the sky before. When we got home a few minutes later we looked at the star-like object through a telescope and it seemed to pulsate slightly. We were able to watch it for about 25 minutes altogether before it sank quite quickly below the distant hills to the west. My first thought was that it was Maitreya’s ‘star’, but this object did not look like the star pictures on YouTube and in Share International, so we would love to know what it was. With thanks for all the work of Share International over the decades. D.V., Waiheke Island, Auckland, New Zealand. I have only today found your website though I first found out about beloved Maitreya in May 2007. I read a leaflet that was from the Mind, Body and Spirit venue and found it interesting and inspiring and really enjoyed reading the newsletter and looking for signs of the ‘star’ etc. Not long after that, whilst meditating by my dressing-table mirror, I had my eyes closed but ‘felt and was told’ to open my eyes and look in the mirror, which I did and there, clear as day was Maitreya’s ‘Hand’ and He said to me: “Maitreya, I AM here”. I was SO overwhelmed inside with such joy and gratitude beyond words, yet felt saddened with regret that my emotions stunned me from thanking Him personally there and then. I have always meant to enquire and write to you and ask you to please enquire what was His message for me? I am so thankful that I have again come in touch and found your website, such a wondrous read, and thank you for all the work and effort that goes into it. On 15 February 2015 we gave a lecture at the spiritual centre ‘de Roos’, in Amsterdam. Attendance can vary greatly but it was really surprising when only one man came. “I’m sure a few more will come, we must leave the door open”, I thought to myself. Instead of giving a lecture, we decided to focus on answering the many questions of the man, a Croatian living in Amsterdam, who had already heard about Maitreya and the Masters of Wisdom. About halfway, we were discussing how Maitreya could suddenly appear here in the room at will, if it served a purpose. A short while later the door opened and an Indonesian woman quietly came in. She was in her fifties and was smartly dressed with dyed hair in a ginger hue. She had a cheerful, kind face with a beautiful smile. She sat down next to Nancy and listened for bit before she started asking questions. She was particularly interested to know what the relationship is between Maitreya and the Master Jesus, according to our information. She told us that her father was Jewish and her mother Catholic. She commented that religions had too much power in the world today. The more she heard, the more eager she became as she asked more questions about who the Messiah had really been when Jesus came to Palestine, two thousand years ago. The door opened for a second time and a short Jewish man entered. He had a serious expression and wore round glasses. The Indonesian lady introduced him as her partner from London and shared how wonderful it had been that he had come into her life, after having lost her husband to a serious illness. She was well aware of everything that was being shared during our discussion. She added some comments of her own, such as her expectation that the new Greek prime minister would express new political views to bring about change and that debt relief is important as it has to do with sharing. She said: “As soon as politicians gain power, they change. It is their duty to protect the people but when people stand up for their rights, politicians deal with them harshly. However, the voice of the people is growing stronger. We all should receive basic income so everyone can live normally. Education and healthcare should be provided for free”. Nancy recalls a special atmosphere from the moment she came in, as if we were being blessed, and that she often touched Nancy’s arm, which felt very familiar, as if they’d known each other for years. We finished our discussion by reading an article about ‘Brotherhood’ by Benjamin Creme’s Master and Maitreya’s Message No.4. As we sat quietly for a bit, she politely asked if she could ask another question. With a mischievous look in her eyes, she asked: “So Maitreya was overshadowed by Jesus?” as if she hadn’t understood anything. She proceeded by mentioning that her partner and she had attended a Transmission Meditation workshop at the [Amsterdam] Information Centre and started reciting the Prayer for the New Age, which she clearly knew by heart. As we stood by the table with leaflets and books, she suddenly started reciting the Great Invocation, which she knew equally well by heart. She then asked about the relationship between Sai Baba and Maitreya and immediately started telling how she’d found fresh £10 notes under a mattress after she had asked Sai Baba for help, while she was taking care of her dying husband. She had known instantly where to look for the money and that Sai Baba had materialized it for her. Finally, she mentioned Benjamin Creme’s latest book Unity in Diversity while pointing to my bag, in which there was indeed a copy of the translation in Dutch. All the while the energies, the blessings became more and more intense, especially after she shared her experience about Sai Baba. What was really remarkable in hindsight is that in this way she touched upon important topics which hadn’t been mentioned during our discussion before, such as Transmission Meditation, the art of Self-realization, the presence of Maitreya and Sai Baba as planetary and cosmic Embodiments of Love respectively, and Unity in Diversity. Who was this remarkable woman and her partner? A.D.D., N. de G., the Netherlands. I’m very interested in Maitreya but wonder how so many sceptical people in this world that we live in will be able to accept the statements made by Benjamin Creme of Maitreya’s existence. If ever there was a time for somebody to give the world hope it would be now, with what is going on in places like Syria, Afghanistan, Iraq etc. I am ex-Army and have seen poverty, hardship and the cruelty that man can do to each other and just hope that Maitreya makes his presence known soon! Photographs of a bright object changing colour were taken by M.Z. on 19 April 2015 above Amsterdam, looking in the direction of the Great Bear (the Plough). Years ago Russian scientists announced that they had discovered gigantic ufos near the sun. They claimed that some of the objects were the size of the moon and apparently very flexible being able to change altitude and position, make sudden very sharp moves in any direction. The ufos were, the Russians said, capable of enormous speeds and could also disappear instantaneously. Recently, it appears that similar objects have been photographed near the sun and their activity seems to be increasing. On 7 May at 06.24 a large figure, possibly a spacecraft, was photographed by NASA LASCO C2 SOHO cameras. The object looks as if it is moving towards the sun. An estimation of its size indicates that the figure may be as large as the surface area of the United States. In a devotee’s room at Sai Baba’s ashram in Puttaparthi, India, a large photograph of Sai Baba has an outpouring of vibhuti. Taken and sent by P.L., UK. We present a selection of quotations on the theme of ‘Harmlessness’ taken from Maitreya (Messages from Maitreya the Christ and Maitreya’s Teachings – The Laws of Life), Benjamin Creme’s Master (A Master Speaks and Share International), and Benjamin Creme’s writings. As I emerge, I shall place before the world the necessity for change. These changes, My friends, are God-given. Man requires, as he moves towards God, to demonstrate that divinity. All man’s structures must shine with the Divine Light. All man’s ways of thought must reveal the God within. This truth, My friends, is at the basis of change. My Presence, already, is effecting changes in men’s thinking, in men’s hearts, and causing them to wonder. My efforts are proving effective despite all appearances. Men are turning again to the truth, to the Laws which are God. Allow Me to show you the way into the New Time; to outline for you the glories, which, if you will, can be yours. Man is made to serve both God and man, and only through that correct service can the path to God be trodden. My Law will be accepted by men. I see around you your aspiration and love, your hope and desire for a better world. Believe Me, My friends, all these will be fulfilled. That New World is now in the making, is formed in thought and desire, and slowly descends. Therefore, My brothers, know no fear. I am among you in many ways. I present Myself to the world in many facets. I galvanize all forms to change. I stimulate all souls to growth. The world is going to be changed, above all, by the countless millions of people, men and women everywhere, of goodwill. It is precisely the people of goodwill who, in the first place, will respond to Maitreya. He will potentize that goodwill. He will confirm in them their attitude to life and will so potentize it that He will build a world public opinion against which no government on Earth can stand. Throughout the planet, old and young, poor and rich, make ready for [Maitreya’s] Announcement, His Declaration of Mission and Purpose, His tryst with mankind. As the old century and era wind to their close, men’s minds are quickening to the new energies which will fashion the forms of the new civilization and impose their qualities on the consciousness of men. These qualities – of synthesis and fusion, tolerance and goodwill, harmlessness and brotherly love – will, in time, bring the race of men to the manifestation of its destined glory. Thus shall it be, and thus shall men enter again into their age-old Covenant with the Divine. Soon will you see Me in full fact. My Presence will become known to you, and, if your response is as I hope, we shall meet and work together as friends. My intention is to place before you the answers to man’s dilemma, to show you that the future holds for all men unbelievable promise. With My Brothers, the Masters of Wisdom, I shall show you the way to release your divinity and receive your inheritance. Ahead of the Paris Climate Change Conference in December 2015, momentum is building from groups representing the world’s major cities: C40 Cities Climate Leadership Group (C40), Local Governments for Sustainability (ICLEI) and the United Cities and Local Governments (UCLG), with support from UN-Habitat (UN Human Settlements Programme). Launched at the 2014 United Nations Climate Summit, the Compact of Mayors is the world’s largest coalition of city leaders addressing climate change by pledging to reduce their greenhouse gas emissions, tracking their progress and preparing for the impacts of climate change. * Accelerating more ambitious, collaborative, and sustainable local climate action. Latin American cities have enormous potential to reduce global greenhouse gas emissions. C40 research indicates that taken together they could cut emissions by 2,500 metric tons of carbon dioxide by 2030, or the equivalent of taking 526 million cars off the road. In another C40 gathering on 10 April 2015 in Seoul, South Korea, 36 Mayors from around the world announced their compliance with the Compact of Mayors. Coming from cities in South Korea, the Philippines, Malaysia, Indonesia, India, Australia, Bangladesh, Canada, USA, Sweden, France, Germany, Turkey, UK, South Africa, Senegal, Mexico, Colombia, Brazil and Costa Rica, the Mayors planned new action and shared successful projects. * Seoul is reducing the city’s energy demand by the equivalent output of one nuclear power plant, through energy conservation and the use of renewable-energy sources. * By 2020, San Francisco will be diverting 100 per cent of its garbage away from landfill, avoiding enormous amounts of greenhouse gases. * Since 2012, Sydney has been replacing streetlights with new LED bulbs (an idea borrowed from Los Angeles), which has cut street lighting emissions by more than 46 per cent. The Compact of Mayors provides the evidence to prove that cities are true climate leaders, and that what happens at the local level can ultimately change the world. In many countries around the world people are being faced with a false choice which, to many impoverished people, is no choice at all. If they choose for jobs, a livelihood and feeding their children they have to accept the destruction of the environment. And a case in point is what is happening in Nicaragua – a giant canal project that is being cut right through their country connecting the Caribbean Sea and the Pacific Ocean and offering an alternative passage to the Panama Canal. The $50 billion plan which entails digging a 90-foot-deep, up to 1,706-foot-wide, 178-mile-long trench will impact rainforests, pristine indigenous vegetation and cut through Lake Nicaragua, the largest freshwater reservoir in the region. The Grand Canal project will join oceans but it divides the population: some welcome the promises of jobs for people in a very poor country, while others fear the inevitable and irreparable destruction of the environment and the siphoning off of profits to foreign developers and employment to foreign workers. Nicaragua is the second poorest country in the Western Hemisphere. With scant or no public consultation and an apparent refusal to heed the warnings of a chorus of scientific and indigenous complaints and protests, the diggers have already moved in. The Grand Canal project was allegedly authorized without prior consultation with affected indigenous communities. The project also involves constructing dams “in an area of frequent seismic activity, which would increase the risk of local water shortages and flooding,” Perez and Meyer wrote. “The lake would probably suffer from salt infiltration in the lock zones, as in locks of the Panama Canal. This would transform a free-flowing freshwater ecosystem into an artificial slack-water reservoir combined with salt water. Declining populations of native aquatic fauna … could also suffer.” The result would be probable environmental catastrophe, they warned.”In our view, this canal could create an environmental disaster in Nicaragua and beyond,” the scientists wrote, citing the destruction of 400,000 hectares of rainforests and wetlands. “The accompanying development could imperil surrounding ecosystems.” For instance, a mere 150 miles north of the most likely route of the canal lies the 7,722-square-mile Bosawas Biosphere Reserve, “tropical forest that is the last refuge of many disappearing species”. Perez and Meyer were also part of a team of 21 scholars from the US and Latin America who co-authored an article explaining potentially negative consequences of the canal. Scientists worldwide also have expressed doubts about the project. For example, the Association for Tropical Biology and Conservation (ATBC) wrote that the canal will affect “some 4,000 square kilometers of forest, coast and wetlands,” which include the system of wetlands of San Miguelito ; the Cerro Silva Natural Reserve; the Río San Juan Biosphere Reserve, which contains seven protected areas, including the Los Guatuzos Wildlife Reserve, the Indio Maíz Biological Reserve and the Solentiname Archipelago. Gro Harlem Brundtland [former Prime Minister of Norway] and I have just returned from Jerusalem, where we undertook our fourth Elders’ mission to Israel and Palestine since 2009 [29 April-2 May 2015]. Our focus on this trip was on peace and reconciliation – not just between Israel and the Palestinians, but also between Fatah and Hamas to secure viable and lasting Palestinian unity. We also wanted to draw attention to the desperate humanitarian situation in Gaza eight months after the devastating war of summer 2014. Former US President Jimmy Carter, President of the Palestinian National Authority Mahmoud Abbas and former Prime Minister of Norway Gro Harlem Brundtland. We deeply regretted not being able to visit Gaza to see the situation at first hand, but what we heard from independent experts and UN officials confirmed our worst expectations. What we saw and heard only strengthened our determination to work for peace and the lifting of the blockade. Gaza’s 1.8 million people are besieged, isolated and desperate. They cannot enjoy any of the aspects of normal life, from trade and travel to health and education, that people in my country – and indeed in Israel – take for granted. Another war would be disastrous not just for the people of Gaza but for all Palestinians and all Israelis as well. Everyone who lives in the Holy Land has suffered under the shadow of conflict for long enough. Both Gro Harlem Brundtland and I have spent decades working for peace in this region. We believe the two-state solution is the only viable solution and remain convinced that a just and lasting deal is possible if all leaders show the necessary political will. In our meeting with President Mahmoud Abbas, we were encouraged by his commitment to convene the Interim Leadership Framework that would include the Executive Committee of the PLO and representatives of Hamas and Islamic Jihad. President Abbas also asked us as Elders to secure from Hamas a written request for the convening of elections, and he committed to hold Presidential and Palestinian Legislative Council elections upon receipt of this communication. These steps might seem merely procedural but they are vital to reconnecting Gaza and the West Bank politically, economically and socially. I know that many people in Israel and abroad find it hard to accept the idea of talking to Hamas. The Elders utterly condemn any terrorist acts that harm innocent people. But if you’re serious about peace-making, you have to sit down and talk to your enemies. It’s what the British did in Northern Ireland, it’s what the French did in Algeria, and it’s what the Israelis themselves did with Yasser Arafat – someone once branded a terrorist who went on to win the Nobel Peace Prize together with Yitzhak Rabin. The Elders left Jerusalem with a mixture of some hope and much anxiety. Rest assured that we will continue to do our utmost to promote peace, justice, human rights and security for all in the region in the months and years ahead. When Pope Francis met with 7,000 children from Rome’s primary schools in the Nervi Audience Hall in the Vatican on 11 May 2015, he said: “There can be no peace without justice,” and asked the children to repeat those words out loud three times. The children’s audience with the Pope was organized by the Fabbrica della Pace (Peace Factory Foundation). Pope Francis expounded on what he called the “industry of death”, the arms industry behind all war, according to the Italian AGI news agency. The conservative Popular Party government approved the highly controversial security legislation referred to as ‘Gag Law,’ despite international criticisms and domestic protests. On 10 April 2015, a group called No Somos Delito or We Are Not a Crime, projected a hologram of protesting marchers filing in front of the Parliament building in Madrid. For the time being, virtual protests in the form of holograms are not illegal in Spain. Incredibly, however, almost every other kind of peaceful protest soon will be if a new law goes into effect as scheduled on 1 July. The approval of this legislation sparked protests as thousands of Spaniards took to the streets to demonstrate against what they consider as a major strike against democracy and human rights. The protesters included Greenpeace activists who gathered at the Spanish parliament. The law prohibits citizens from recording or taking pictures of the police, and citizens are obligated to show their identification card if requested by officials. Any demonstration that takes place outside parliament, or other buildings which provide “basic public services,” will be considered illegal, regardless of their nature. Furthermore, it grants authorities the right to perform immediate deportations and to legally disband peaceful demonstrations. The law will also enable the authorities to punish any citizen that resists eviction – eviction resistance is a common practice in Spain, after it became widespread when the economic crisis broke out in 2008. The law also implements new fines of up to €600,000 (over US$650,000) if a demonstration is considered by authorities to be unlawful. Any action considered a “lack of respect” toward authorities can also be sanctioned under the new legislation, including with prison sentences. International human rights organizations, including the United Nations, have criticized the law due to the excess of power that it gives police and the lack of accountability mechanisms to prevent abuses. On 16 April 2015, close to 100,000 Chilean students marched on the capital protesting rampant political corruption and its effects on national education. Under the slogan ‘Let Chileans decide their education’, this was the first government authorized march of 2015. High school, college students, and teachers said they were fed up with the growing frequency of political scandals, and politicians refusing to make quality reforms that educators and students have requested for years. Student leaders argued that they should be included in the drafting of reforms that the government will send to Congress this year, instead of corrupt officials. ‘Get them all out of here’, one student’s poster read. “If reforms are stalled in La Moneda (Chilean Presidential House), we will fight for them through social movements,” deputy Gabriel Boric, former leader of the Autonomous Leftist Student Movement, said in support of the march. The march focused on pressuring President Michelle Bachelet to fulfill her campaign promise of education reform. Students now say they are fed up waiting for changes and are disgusted by a series of corruption scandals involving politicians and the business elite. “We need to protest against this caste of corrupt politicians and businessmen who are involved and who are not ruling for a majority, and instead they’re cooking up the reforms behind four walls,” said Aurora Isidora Rozas, a spokeswoman for the co-ordinating assembly of high school students.